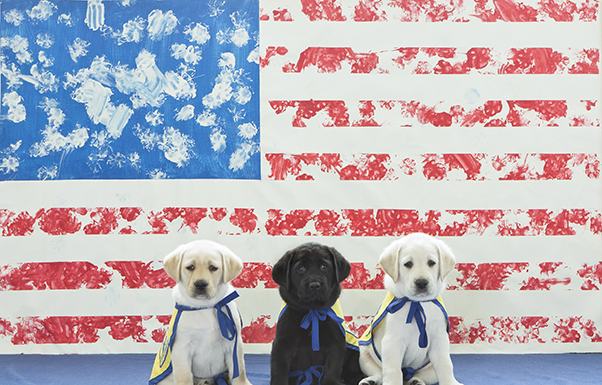 Today is Flag Day and we're celebrating with an opportunity for you to win a one-of-a-kind, puppy-made, American flag! Your donation will help change the lives of veterans, children and adults with disabilities. Donate today. Make Every Day Independence Day — Give a Dog a Job. Build-A-Bear Workshop® will donate $1.00 from the sale of each Promise Pets™ furry friends purchased in stores June 28 through August 8, up to $50,000, to Give a Dog a Job and support children with disabilities. Learn how your business can support Canine Companions. Calling all Canine Companions graduates! Now's the time to nominate your exceptional Canine Companions assistance dog for the AKC Humane Fund Awards for Canine Excellence. Click here to nominate the excellent dog in your life. Are You Raising a Calendar Puppy? Our puppies are the cutest! Submit an image of the puppy you are raising to cci.org/share now through July 20 to be considered for our 2019 Canine Companions Puppy Calendar. Please note: Photos must feature the puppy in their yellow cape. Share now. Send an ecard to your favorite dad or grad. See what Waldo, Foley and Able have been up to on our blog. Do you “speak” dog? Test your canine IQ with our quiz. Grab a leash for DogFest. Does your company match your charitable gifts? Find out here.